If ever you find yourself with free time and an urge to travel somewhere but are lacking in inspiration, then its always exciting when a flight booking website displays an option to search ‘Anywhere’. 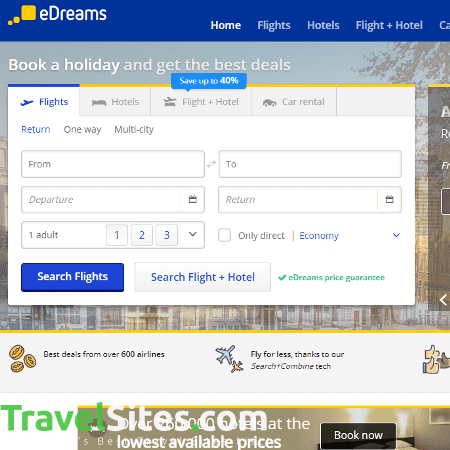 eDreams has exactly this feature, something it shares with other booking sites such as Skyscanner and Kiwi.com, making for a more interesting way to choose where to go. Although it lacks the open-ended ‘Anytime’ option that Skyscanner has, its thumbnails displaying ‘inspiring destinations’ are nicely presented, with the price of flights departing from your preferred location shown clearly underneath. Once you have chosen where you’re going, eDreams takes you through to a host of different options from various airlines, with the ability to toggle filters down the left hand column if you would like to get more specific. I like the ‘Smart Choice’ feature that appears at the top, claiming to be the selection that gives you the best value for money, fewest stops and flying to and from the most popular airports. After picking the precise flight, the website displays a seat map of the aircraft you will be flying with, offering details of extra legroom, preferred seating and their ‘smart choice’. Annoyingly, when I was on this page a pop-up appeared informing me that there was only one seat left, despite the seat map showing over 30 available places. Similar to other booking sites you can also sign up to their email notifications scheme that will alert you of travel discounts, voucher codes and exclusive deals, while there is also detailed information on baggage, cancellation policy and what to do in preparation of your flight in their Help Centre. In general, I found the whole website quite slow to use, particularly when loading the seat map section which took longer than any other website I have used to book flights. It’s also difficult to know if the prices you are being shown are the cheapest available, as it does not take you through to the airline’s website to make the booking.